Making healthy, warm soup has never been so fun. Yummy for your tummy. Are you ready to make the most delicious soup ever, and all by yourself? This is a very fast and educative way of learning how to cook. 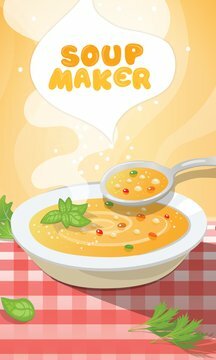 Soup maker deluxe presents you with a variety of flavours. You can cook vegetarian or chicken soup for your lunch or dinner. First select a recipe from the cooking menu: chicken, mushroom, tomato or spinach soup. Then chop all the ingredients and place them in the cooking pot. Add other colourful vegetables from your garden and spice the soup with a tiny pinch of salt and pepper if you think it needs it. Heat up the stove and mix the soup until it becomes thick and creamy. Now your meal is ready to be served. Select your favourite bowl to serve it to your dear ones. Everybody can now enjoy eating your delicious hot soup. 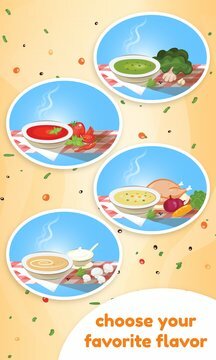 Enjoy this great cooking game!